We have just released an update to CodeTwo Exchange Sync (v. 2.6.0), which introduces some new features in item filtering and modification functionalities. It also includes several bug fixes and application code improvements. New modifications: Convert meeting to regular appointment, Remove attachments, Clear body, Hide private content. New: The option to determine a subdomain while choosing folders for synchronization. New: The possibility to sort folders added to the list of folders scheduled for synchronization. New: The option to filter items multiple times using the same property. Changed: Filters were renamed to Conditions. Changed: Mailboxes are displayed in the Last name + First name pattern while choosing folders for synchronization. For the full list of changes, go to the version history page. The update is free of charge for all version 2.x license owners. 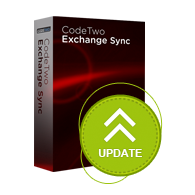 CodeTwo Exchange Sync is an Exchange Server add-in that enables creating server-sided mailbox synchronization tasks. Thanks to this server-based solution users can have their private Exchange Server folders synchronized with public, or other users’ folders. The synchronization can occur in many modes, e.g. many-to-many, one-to-many, many-to-one. Furthermore, the synchronized items can also be filtered and modified during the replication. Thanks to the wide range of folder synchronization possibilities the program opens, it also helps to solve many common administration problems, e.g. the synchronization of public folders with mobile devices, or creation of auto-updated group calendar on Exchange. For more information, go to the product page. I’m trying to leverage exchange sync to Room Calendar that act asa classroom using it to schedule all classes and sync the content to the student’s calendar. Will exchange sync capable of this scenario ? Will exchange sync be able to sync to Distribution group and propagate the changes to the members? Appreciate if I can get an answer immediately. I believe you are referring to CodeTwo Exchange Sync – I will add your suggestions to our backlog so the dev team can consider implementing them in future releases of the program. If you have any other ideas for software’s improvement – let us know!